Has Premier League scheduling favoured Manchester United? 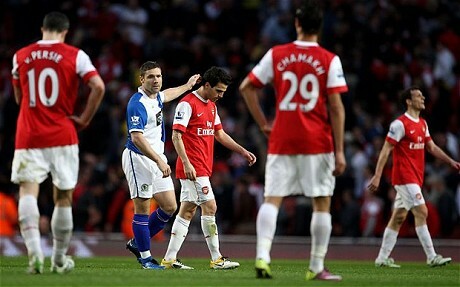 Did Arsenal drop points against sides like Blackburn because of Premier League scheduling? In March, I studied the impact of unaligned Premier League kick offs for title contenders. It came off the back of a suggestion from Arsene Wenger to make the final rounds of Premier League matches kick off simultaneously. I would recommend reading that piece before continuing (click here), though it’s not a prerequisite, since I cover the main findings below. I established that Manchester United, Chelsea and Arsenal could either be ‘pace setters’ or ‘responders’ in any given round of matches. If a team was a pace setter, they played before at least one of the other teams, and if a team was a responder they played after at least one of the other teams. I found Chelsea to be the best pace setters, but poor responders along with Arsenal. Breaking responder statistics down further, Arsenal and Chelsea appeared remarkably more likely than Manchester United to win after a title rival had dropped points. Equally they appeared remarkably more likely than Manchester United to drop points after a title rival had won. As Zach Slaton of A Beautiful Numbers Game blog pointed out to me, there may have been biases. For example, did teams tend to drop points after a title rival had won earlier in the weekend because they tended to face harder games away from home in later kick offs? This isn’t wholly unrealistic, since teams often responded in televised late Saturday or Sunday kick offs, matches that by definition tend to be ‘bigger’ (a euphemism for ‘tougher’). I can model for these potential biases, but more on this later. Rounds where they all play at the same time, since there is no element of pace setting or responding. Rounds where only one team plays in a weekend/midweek, for the same reasons above above. Rounds where title rivals play each other. The rationale for this is the third team knows in advance that points will be dropped, and are therefore not reacting to an unexpected result or dropped points. Matches where a team can no longer win the league. This only affects matchday 37 in both seasons, when in 2009/10 Arsenal could no longer win the league, and in 2010/11 Manchester United won the league before the other two teams played. I effectively want to look at ‘normal’ rounds of matches, or as close to normal as possible, to see the general effects of pace setting and responding. The table below outlines the win percentages of the three teams in the various scenarios. To explain, ‘eligible matches’ refers to matches not excluded by the criteria outlined above. ‘As responder post-win’ refers to the win percentage as a responder after at least one title rival had won earlier in the round of matches. ‘As responder post-draw/lose’ refers to the win percentage as a responder after no title rival had won earlier in the round of matches. The most important row is the last. Statistical modelling allows me to compare the three teams in identical scenarios – against teams of the same strength in the same location – removing the biases explained earlier. What the results show is that the win percentages of the three teams in most circumstances (first 3 columns of win percentages) is, statistically, no different from each other. This means that generally Arsenal, Man United and Chelsea are as likely to win matches as each other. In reality this isn’t entirely true, as I haven’t taken into account injuries, form or factors other than location and opposition strength that might affect a match outcome, but that’s not what this analysis is about. The fourth column of win percentages shows that Manchester United are statistically more likely to win than both Arsenal and Chelsea after a title rival had won earlier in the weekend. In this sense, they do not tend to ‘stumble’. Equally, the final column shows that Arsenal and Chelsea are statistically more likely to win than Manchester United after the best result of any title rival earlier in the weekend had been a draw or defeat. Both teams are good at ‘capitalising’ compared to Manchester United. Unfortunately for Arsenal and Chelsea, the opportunity to capitalise is a rare occurrence, since title contenders tend to win the majority of their matches. Remember, significance comes down to holding all else constant. The model compares Arsenal or Chelsea to Manchester United when placed with identical opponents in identical locations (home or away). For example, take matchday 31 this season. Manchester United, as pace setters, won 4-2 at West Ham. Arsenal and Chelsea, as responders, both drew their matches after Manchester United’s. Had Manchester United been placed in the same situation (responding to an Arsenal or Chelsea win against opponents of equal strength at the same location), they would have been 33% more likely to win than either Arsenal or Chelsea, according to the model. In the opposite scenario, we can look at matchday 16 of the 2009/10 season. Chelsea drew 3-3 with Everton at 3pm on Saturday, and two hours later Manchester United lost at home to Aston Villa. On Sunday, Arsenal beat Liverpool. Hypothetically, had Arsenal been playing Manchester United’s match (i.e. the same opposition in a home fixture), they would have been 38% more likely to win compared to Man United, according to the model. Many of the conclusions are similar to or extensions of the original post in March – I’ve mostly validated them by testing for statistical significance. Arsenal and Chelsea fans may be disappointed that they haven’t been pace setters more often, given they haven’t been great at responding to victories – typically those of Manchester United. In fact, if you take all matches (ignoring the ‘eligible’ criteria) then you find Arsenal are statistically less likely to be a pace setter than Manchester United. The results are insignificant for Chelsea. Given that the majority of the time Arsenal will respond after a win, something they are poor at, the scheduling shouldn’t please the Gunners at all. Although on the whole no team is better at responding than another, the knock-on effects of Arsenal defeats are well known. These effects aren’t captured in the model since they are difficult to quantify, though they would no doubt improve the model. I do find it a little disappointing that for five consecutive matches between 2nd April and 24th April 2011 Arsenal were responders (six if you include their match against Manchester United on 1st May) whilst in almost exactly the same period Manchester United set the pace in five consecutive rounds, winning all but one match. Unsurprisingly, as suggested by the data, Arsenal won only one match during their run. Chelsea may also feel slightly hard done by. During the middle part of the season, from 14th November to 14th February, they played 14 matches, 10 as responders. They won only 2 of these 10 matches. In the same period, Manchester United set the pace in 9 rounds, winning 7 times. External factors such as Ray Wilkins’ departure and the arrival and accommodation of Fernando Torres are not accounted for (again because they are difficult to quantify), but it does seem the alignment of matches did Chelsea few favours. That’s not to say Premier League scheduling has been the only, or even a major factor in deciding the destination of the Premier League title, merely that it does have a positive and negative effect on some teams in certain situations, and is worth a consideration during next season. Do you think Premier League scheduling had an impact on the title race in the last two seasons? Is it something the television companies and league should consider? Please provide your thoughts in the comments section below. Well the data was collected from the start of the 2009/10 season; the case studies I picked out were only examples, so I think there’s evidence to suggest the issue is deeper than you imply. You may want to look to validate the results by comparing against previous seasons where Chelsea or Arsenal won the league. It would be interesting to see how much of a factor scheduling has contributed. Like I wrote in the article, I’ve collected data for the last two seasons, so it includes Chelsea’s title-winning 2009-10 season – evidence seems to hold across these two seasons. Would stretch it back further but Liverpool, not Arsenal, were title contenders in 2008-09. And things were a lot different when Arsenal last won the league!